The Cumberland & Dumfriesshire Farmers Mart P.L.C. had forward 9131 store and breeding sheep on Tuesday 12th October, 2010. Trade for all classes was buoyant with buyers from all over the country present. The 6,412 store lambs sold to a full ring of local and distant buyers to a top of £63.80 for Dutch Texels from S Dalton, Greenside. Included in the sale were 2,000 Cheviot lambs which upheld high rates selling to a top of £62.20 for North Country Cheviots from East Murton and £59.80 for Hill Cheviots from Wardlaw. Suffolk £63.20 Gospel Hall, £61.80 Lynnshield; Cheviot £59.80, £59.20 Wardlow, £58.80 Linhope, £58.20 Powisholm, £57.20 Crossdykes; Texel £63.80 Greenside, £63.20 Rinnion Hills & The Park; Charollais £58.80 Highloveladyshield, £55.20 Low Stokoe; Greyface £60.80 Rotherhope, £60.20 Highloveladyshield, £57.20 Greyside; Cheviot Mule £55.80 Wardlaw; Blackface £60.20 Horseholme, £57.80, £57.20 Greyside, £53.80 Tecket; North Country Cheviot £62.20 East Murton, £58.80 Gospel Hall, £55.20 Sorbietrees; Swaledale £35.80 Haithwaite; Beltex £55.80 The Park, £54.80 Edges Green; Llynn £60.80, £56.80 The Height; Romney Marsh £50.20 Holme Farm. Suffolk £53.80, £48.80 Garth Head; Cheviot £54.80 Crossdykes, £53.20 Girnwood; Texel £64.80 Crossdykes, £56.80 Rinnion Hills; Greyface £57.20 Rotherhope; Blackface £39.80 Lowes. The 2,719 breeding sheep of all classes included the 2nd sale of Hill ewes. All classes were dearer with a packed ring of buyers ensuring a solid trade all day. Included in the sale was the dispersal of 150 Beltex x Texel shearlings to 3 shear ewes from Messrs McIllwraith, Mouldy Hills, selling to a top of £225 for Beltex shearlings, others to £145, £130, £124, £122. 2 Crop £185, £135, £118, £115. 3 Crop £120, £110, £106. 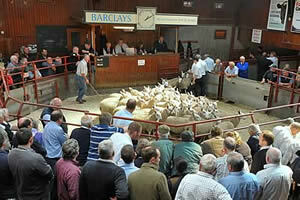 Other ewes sold to £180 for Suffolks (1 crop) from J Bell, Crofthouse. Greyface £116 Shielsknowe & The Gall, £96 Bathall; Cheviot Mules £118, £110 Maxton; North Country Cheviot £95 Nether Ernambrie; Texel £96 The Gall; Cheviot £70 Fingland; Swaledale £86 Crofthouse, £71 Orthwaite Hall. Cheviot £66 Newbie Barns, £60 Glendinning, £58 Meikledale; Blackface £59 Collinbank, £58 Skelfhill, £57 Sundhope & Meikledale; Greyface £108(1 crop) Shielsknowe, £98 (3 crop) Shielsknowe , £94 Mosside; Texel £106(3 crop) Linton House, £81(4 crop) Hoddam & Kinmount Est; North Country Cheviot £88 Stackbraes, £61 Borthwickshiels; Swaledale £75 Haithwaite, £66 Orthwaite Hall; Llynn £95, £76 The Height; Zwartbles £88 Hartshaugh Mill. A quality show of ewe lambs topped at £122 for Texels from AR Bell, Kirkton, who sold 108 lambs to average £93.70. Pure Suffolk ewe lambs to £120, £105 Crofthouse. Suffolk x £56 Winshields; Texel £122, £110, £93, £90 Kirkton; Greyface £86 Bailey Mill, £84 Hardhurst; Cheviot Mule £76 Crosslee; Llynn £73 The Height.